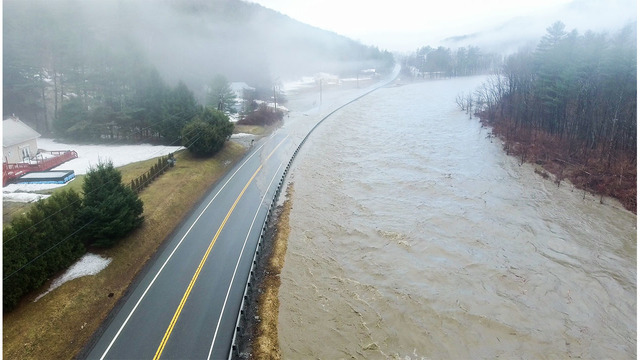 Rain and melting snow have caused widespread flooding Monday across Vermont. Vt 107 in Stoockbridge Monday. 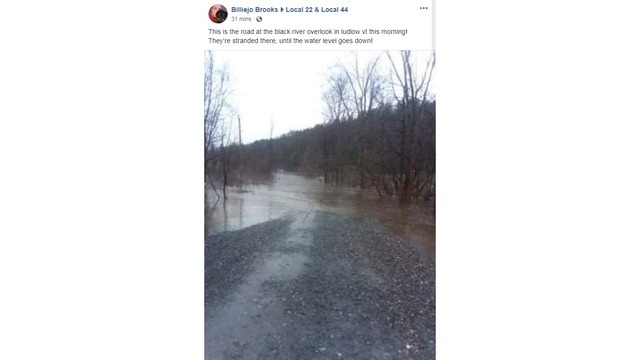 In Ludlow, a viewer tells us high water has stranded the residents of Black River Overlook on Rublee Lane, near Vt 100. Below are road closures we're aware of. We'll be following the situation throughout the day, so check back. And feel free to update us on your area on our Facebook page. The National Weather Service has issued a flash flood warning for parts of Addison, Rutland and Windsor counties. Flood warnings or watches are in effect for other parts of Vermont. VTRANS reports that, as of about 11 am this morning, at least four roads in Randolph were impassable and not safe for use. - Vermont Route 14 south: A large section south the Randolph Road under running water. In Killington, first responders had to rescue people from a car that had become stranded in flood water. Police warn drivers not to attempt to pass through water-covered roads. More road closures can be found here.